Pentagon's No. 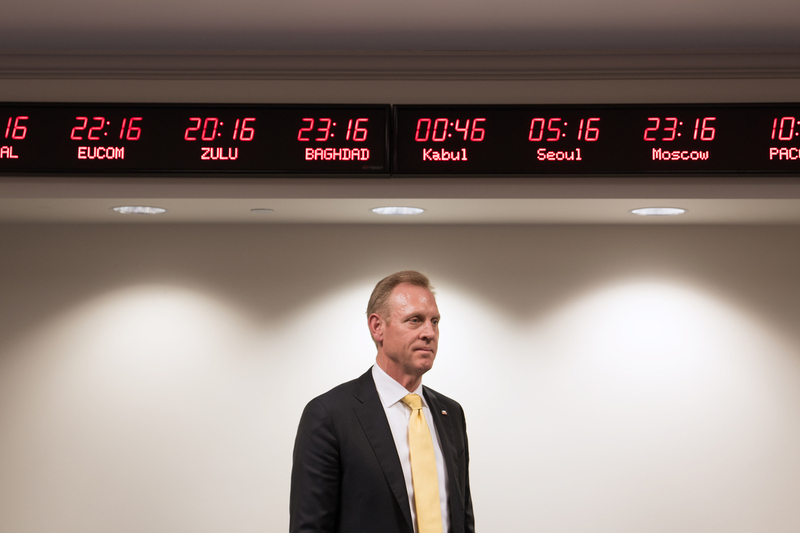 2 Watches The Money — And The Future : Parallels Deputy Defense Secretary Patrick Shanahan views a rising China and proliferating military high tech as key challenges to the long-term security of the United States. Deputy Secretary of Defense Patrick Shanahan at the Pentagon on Monday. As the deputy to Mattis, Shanahan is charged with making the military more "lethal," keeping an eye on emerging threats and assuring the money is spent wisely. Shanahan is essentially the chief operating officer for the Pentagon. He handles everything from supplies for American troops in Syria, to fixing problems with the Navy's new aircraft carrier to keeping pace with the Chinese military. He discussed his role in a wide-ranging interview with Morning Edition host Steve Inskeep. Shanahan says 1,000 Pentagon contracts are signed each day. The defense budget is more than $700 billion, much of which is spent with an eye toward the future. "The investment in weapons systems is long term," says the former Boeing executive who helped spearhead development of the company's 787 Dreamliner aircraft. "So when we watch whether it's the Chinese or the Russians or what extreme terrorist organizations are doing we have to put an eye towards what are those capabilities where we want to extend our advantage." An advantage that Shanahan, an engineer who holds two advanced degrees from MIT, and defense analysts say is eroding. New technologies are being created every day and are sweeping the world, he says, and that will shape the future course of war. "Technology flows everywhere in the world freely," Shanahan says. "So we shouldn't be surprised that other smart people are using technology and making investments in military capability." For example, Shanahan says the U.S. is able to use its cyber prowess to shut down the Islamic State's propaganda efforts on the Internet. "We've been very disruptive with ISIS and we've been able to track the way they distribute information," he says. "We've been able to attack the way they distribute propaganda." What about U.S. cyber attacks against nation states? He won't say. But he looks to where all this could lead. 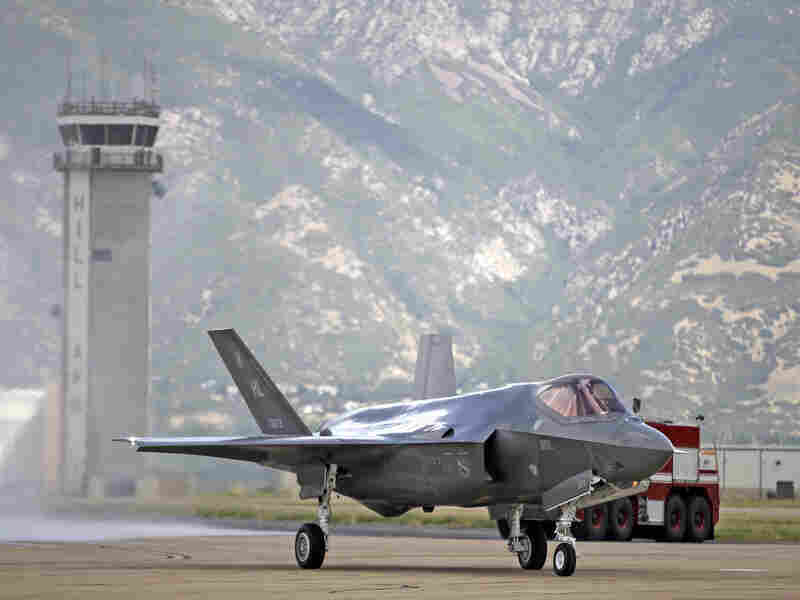 The F-35 Joint Strike Fighter, seen here at Hill Air Force Base in Utah, is the most expensive weapons system in Pentagon history. "I think you're going to have cyber systems battling cyber systems, you know, trying to offset vulnerabilities," Shanahan says. "It wouldn't be surprising to see drones trying to stop each other. A drone is just an unmanned airplane. It's not any different than today when you have two manned airplanes meet. Drones are just the low-cost version." Inskeep asked Shanahan if he viewed China as a far greater threat than Russia. "If you look at their GDP and their ability to invest in capability I think you're right," Shanahan said, adding that it's not just China building up its number of missiles or buying an aircraft carrier. "We think about China not just militarily," he says. "We use the term 'great power competition.' We see their growth in the military, their pursuit of predatory economics, their theft of intellectual property. We see all of those things as disruptive and threatening to the American way." China is also investing in cyber as well as weapons that can destroy satellites, a great concern for U.S. communications and war-fighting ability. "Space was always a sanctuary," Shanahan says. "It was a place where you didn't have to protect your assets, it was a place that you could operate freely. That's not the case anymore. And since so much of our commerce and way of life is affected by our use of [global positioning satellites], sharing of communications, sharing of data, that we need to make sure we're protected and that we have resilience so we can continue day-to-day the operation of our businesses and defensive systems." Shanahan points out that there have been no space attacks, no killer satellites taking out a U.S. satellite. At least not yet. "So do we assume that it will continue just as it has in the past or should we safeguard this important infrastructure?" For Shanahan, that's one more thing to think about. "We have time to solve a lot of these problems," he says. "We have time to invest in security." Meaning, asked Inskeep, we're not in a major war now? "Right. Exactly," Shanahan says. "Prepare for a cold winter. When you look at the people in this department, the skill and the experience, the fact that we have this time and — for a short period, who knows how long the budget will last — make the most out of it. You know, developing these weapons systems and thinking about the future... this isn't the freshman econ class, this is the Ph.D. physics class." But with the increased budget for the Pentagon, there are questions of where the money is going. Is it being wasted? Are the weapons systems working? Take the F-35 Joint Strike Fighter aircraft, the most expensive program in Pentagon history. It's been plagued with problems and cost overruns. 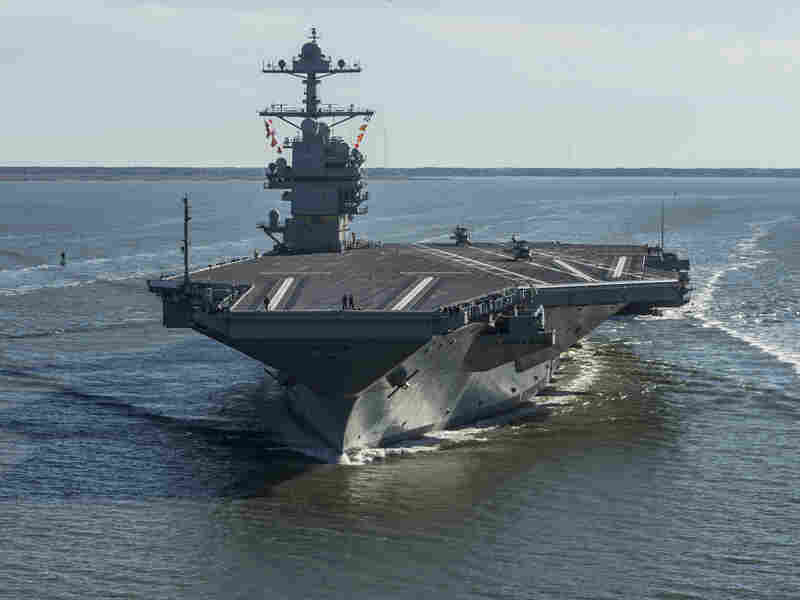 Or the Ford-class aircraft carrier, which had troubles with the elevators which move fighters from the hanger deck to the flight deck, with the catapults which launch the planes and with the arresting gear which captures aircraft as they land. "You always find problems when you're doing development," Shanahan says. "The fact that you wouldn't find problems means you didn't take enough risk." "I've been on many development programs whether it's a missile system or a helicopter, an airplane. Every one of them definitely had problems. And the whole idea is to bring those problems out in time so you can deliver something that works." And of course spending billions and billions of more dollars on defense means someone has to pay for it. Does Shanahan agree with former Joint Chiefs Chairman Adm. Mike Mullen, who said the national debt is a national security issue? "I think so," Shanahan says. "I think about, you know, my kids having to write a check later on to pay for the money I'm spending now, in the form of debt service." But the whole point is to make sure the money is spent wisely, and the Pentagon is in the best position to innovate, on everything from how it does business to how it builds new weapons. "Innovation is messy," Shanahan says. One of the examples Shanahan uses at the Pentagon — on the failure to innovate — is the Kodak Company, which ruled the photography world for a hundred years and had 70 percent of the market. Even though Kodak invented the digital camera, the company ultimately went bankrupt. Executives brushed aside the new camera, thought the battery was too small, the picture wasn't good enough and the memory was too expensive. "And so you know the key is just because something is working doesn't mean you should try to stick with it forever. But understand how to make that transition." So does Shanahan think that he might have his own Kodak moment? That the expensive Joint Fighter Aircraft, for example, might at a future time be vulnerable to the new technology of an adversary, who will be able to shoot it down, make it irrelevant? "Oh they won't. I mean, I know they won't. I mean, what they'll do is they'll find ways to counter its effectiveness," Shanahan says. So in return, the Pentagon will have to integrate other systems or weapons, perhaps in space or on the ground, to retain that fighting edge. The "fun part," he says, is the cat and mouse game. Morning Edition's Miranda Kennedy and Jacob Pinter produced and edited the audio interview.